worked together on a World War One remembrance project called Scars of War. 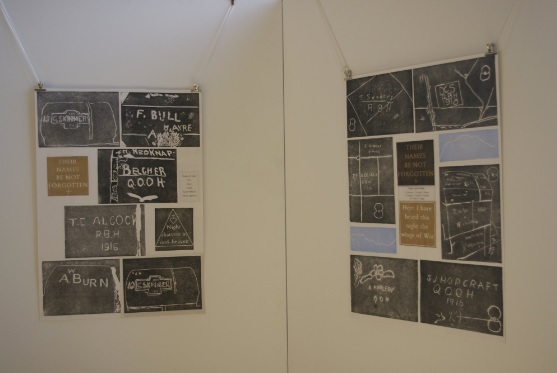 This project used the soldiers’ graffiti of the tower of King’s Lynn Library as the inspiration. The name alludes to the physical and emotional scars on those involved in the Great War and the “scars” the graffiti has left on the buildings. True’s Yard Fisherfolk Museum, Stories of Lynn, St Nicholas’ Chapel, Lynn Museum, King’s Lynn Library, and The Custom House were the locations chosen as all have some historic graffiti as part of their archives [this unique historical resource was discovered and researched by Kevin Hitchcock and we will be sharing this fascinating story very soon – ed.]. These snapshots of history became the inspiration for creating our own modern graffiti in an artistic way to commemorate World War One and keep the memory of our historic past alive. 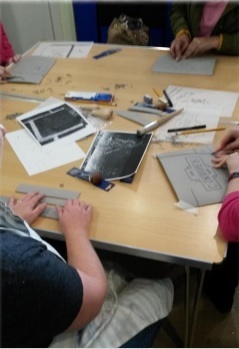 Each location ran a lino cutting and printing workshop lead by artist Rebecca Hearle and work from these 6 sessions were collected together to form an exhibition which was celebrated at a special event at King’s Lynn on Monday 12th November. This was an evening of remembrance hosted by Mayor of the Borough of King’s Lynn and West Norfolk, Cllr Nick Daubney. The evening revolved around the telling of stories of the figures from King’s Lynn’s history in World War One. 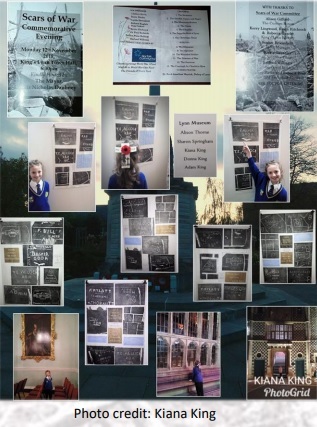 We’ve been very lucky in that Lindsey Bavin from True’s Yard has sent through many of the readings from this event and we will be posting them all over the next few weeks, we also plan to the fascinating stories behind the original graffiti which inspired this wonderful project. The pieces of art created for the project are currently being framed and will then be on display in the places where they were created so visiting King’s Lynn in the new year seems a must to see these prints. This entry was posted in Art Exhibition, Arts projects, From the Archive and tagged air raids, graffiti, King's Lynn, We Will Remember Them. Bookmark the permalink.